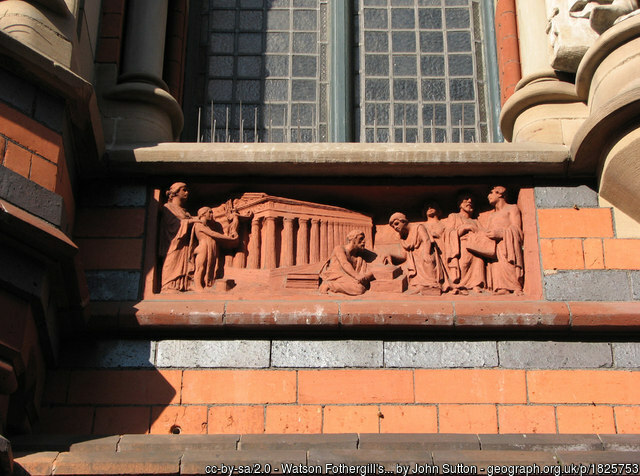 One of the most interesting discoveries I’ve made while researching the buildings of Watson Fothergill is the identity of the sculptor of the terra cotta panels on two of his Nottingham city centre buildings. It turns out that the panels on the Parliament Street side of Furley & Co. grocers (now Lloyds Bank) and Fothergill’s Office on George Street were both created by Benjamin Creswick (1853-1946). Creswick was born in Sheffield in 1853, the son of a spectacle frame maker. He was apprenticed to the knife-grinding trade. At the time this was difficult and dangerous work, often leading to lung disease from the inhalation of stone dust or the risk of serious injury (even death) from the breaking or disintegration of the stone grinding wheel. After showing early signs of lung disease, Creswick visited a doctor. The doctor asked if Creswick had any other skills by which he might earn his living and Creswick produced from his pocket a small bust of Dante modelled in terra cotta. So impressed was the doctor that he ordered a bust of himself from Creswick. Creswick had been attending sculpture classes at Sheffield School of Art. He also visited the Walkley Museum, the art gallery set up in Sheffield by John Ruskin. The eminent art critic had set out to feed the minds of the working men of Sheffield and the city is still the home of The Guild of St George and a large portion of Ruskin’s collection. The Walkey’s curators, Henry and Emily Swan, persuaded Creswick to exhibit his work in 1876. 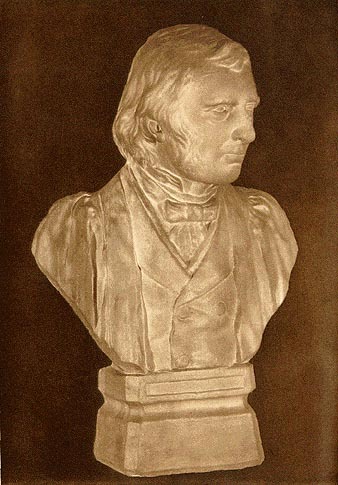 Ruskin was encouraging and the Swans lent Creswick a photograph of the art critic and from this is was able to model a small portrait bust. Impressed by this, Ruskin invited Creswick to his home at Brantwood in Cumbria to model a portrait bust from life. Ruskin continued to help Creswick, connecting him with employers in Bewdley and supporting his family by paying for lodgings and a studio at Coniston. Ruskin helped to teach Creswick and sought patrons and commissions for him. His aim was to make buildings “sparkle with interest,” and he went on to create sculpture for several buildings, including a bust of Thomas Carlyle which is still attached to the philosopher and historian’s house in Cheyne Row, London. He also created portrait busts of Homer and Dante for Leeds City Library. Creswick became a teacher at Birmingham Municipal School of Art, furthering Arts and Crafts ideals. He continued to develop his career as a sculptor for thirty years. 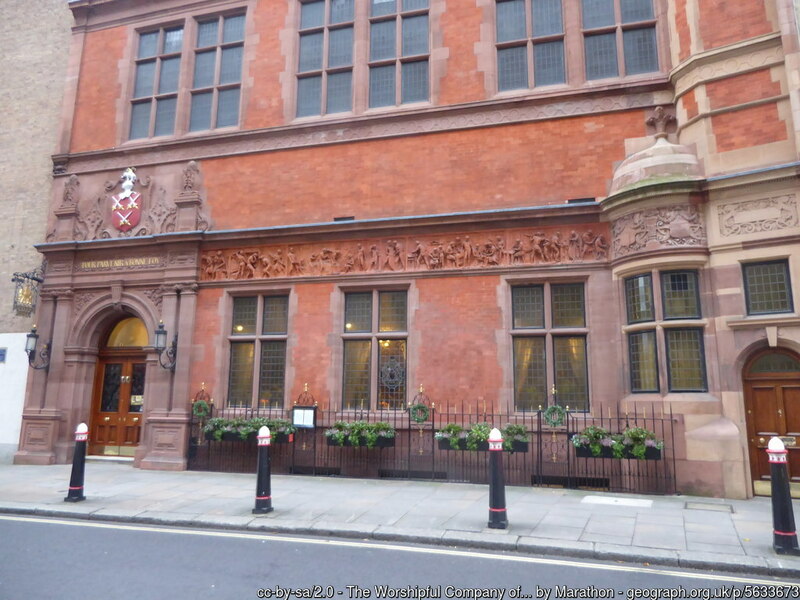 One of Creswick’s major commissions was for the frieze on the Cutlers’ Hall, in London (1887). Possibly his best known work, it depicts the various stages of the cutlery manufacturing process, with particular attention to the harsh working conditions which the artist himself had experienced working at the grindstones. Other notable Creswick sculptures (just about) survive in Birmingham on the Bloomsbury Library and the Handsworth Library. Little is known about his association with Watson Fothergill. I contacted Annie Creswick Dawson, the sculptor’s great granddaughter who has been researching Creswick’s story for many years. She has travelled the world searching archives and libraries to find out about the artist’s life and to locate all of his surviving works – these include carvings, terra cotta sculptures, bronzes, friezes, wall decoration and metalworks. Annie confirmed that the Nottingham terra cottas are indeed Benjamin Creswick’s work, but that they had been mistakenly cited in a study as being located in Northampton, so it had taken a while for her to find them. Consequently they are not mentioned in her book on Benjamin’s Creswick’s life and work and we can only surmise how Creswick came to work on Fothergill’s buildings. Did Fothergill have any connections with John Ruskin and the Arts and Crafts movement? From 1895-7 (the period when Furley & Co shop and Fothergill’s Office were being built) Creswick was working in Birmingham and was Professor of Sculpture at the Art College. Did Fothergill come across Creswick’s work through artistic connections? Perhaps we shall never find out, but if anyone has any information please get in touch with Dr Stuart Eagles, a companion of The Guild of St George, who has taken over the Benjamin Creswick website from Annie. Many thanks to Annie Creswick Dawson for her help and thanks to The Guild of St George for the copy of her book (with Paul Dawson), “Benjamin Creswick”. Discover Benjamin Creswick’s terra cottas on Watson Fothergill’s buildings on The Watson Fothergill Walk or contact me to book a private tour for a small group.